As more companies discover the benefits of using an expense management platform, the market for them is growing fast. While at first glance it might look like most of the feature set is identical across different products, there can actually be quite different — and as it turns out, one of the more subtle differences is also one of the most important. Remember when you were still processing expenses the old way? When you had to print out a form, fill it out by hand and hope that you still had all your receipts in your wallet? Surprisingly, most expense tools aren’t that much different — they also require you to fill out an entire expense report before you can send it in and get reimbursed. This can be pretty inconvenient when you’re just trying to file a single expense, and could significantly impact how long it takes before you’re reimbursed. You often need to wait until the end of the month before you can file a report, which means that you could be waiting a long time. We’ve decided to do things differently. Instead of forcing you to fit our schedule, we’re putting you in charge by using Rydoo’s line by line expensing model. But, what is exactly an expense line? 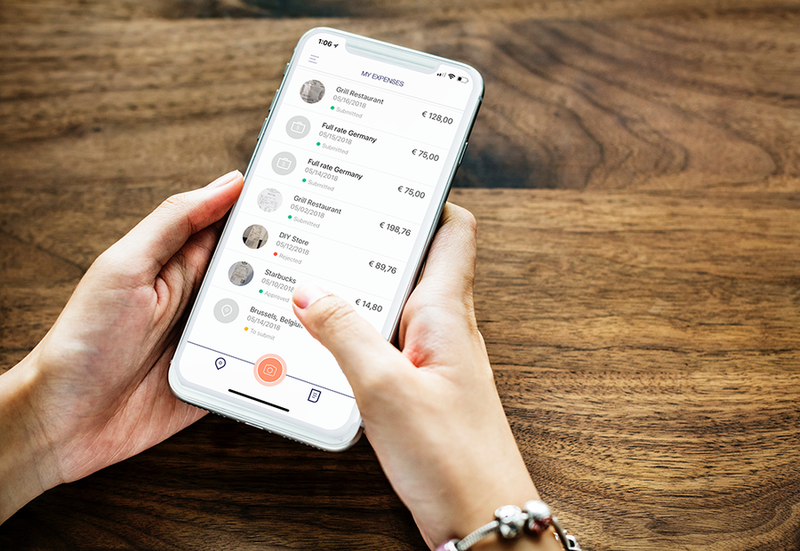 It’s easy, every time you create an expense using the Rydoo app a line with all the information relative to that expense will automatically be created, therefore you can directly send that expense to your finance department to be approved in real time. Gone are the days of filling up a whole report — in fact, there are no reports at all. Forget those days when your expense report could have been rejected just for one or two unjustified expenses. Rydoo is designed to work with expense lines, which means that you can process purchases individually, on the go, as they happen. These are not the only benefits, without expense reports you don't need to wait until the end of the month to have your money back. Thanks to the line by line expensing you can dramatically reduce the reimbursement time in your company, sometimes you can even have your money back within a few minutes, making your employees happy and more productive. It works like this — first, you go out and make a business purchase. Next, you open up the Rydoo app on your phone and take a quick picture of the receipt. Our OCR technology then automatically parses the text, submits it as an expense and, if needed, sends it to the right manager for approval. That’s it! No forms, no hassle — all you need it your smartphone. Line by line expensing processing changes the way you think about doing your expenses in a positive way. Of course it’s nice to be able to swiftly go through your expenses and get your time back, but for us it’s about more than that. The immediacy of being able to take care of your expenses on a whim gives employees a lot of flexibility — they can scan a train ticket right after boarding, for example. This also helps a lot with avoiding your receipts pile up on your desk, slowly growing into a mountain of ridiculous proportions. All in all, it makes people think about their expenses differently. By enabling them to take action immediately, it becomes less of a chore they need to force themselves through once a month — instead, it’s only a few taps and swipes before they can throw out the receipt and get back to their job. We realize, however, that a great product is more than just a collection of tools — it also has to offer a stellar user experience. In a market that’s overflowing with products that haven’t spent much time on their design, Rydoo stands out with a carefully crafted design and an easy-to-use interface. By doubling down on this we’ve ensured that anyone within the company can get started with processing their own expenses in minutes. Still unsure about how something works? Our customer support team is always on hand to answer any questions you might have. Ready to get started with expense lines? Sign up for our free trial and give us a spin.